Image show is NOT model specific. The parts shipped WILL be the correct parts for a MINI. 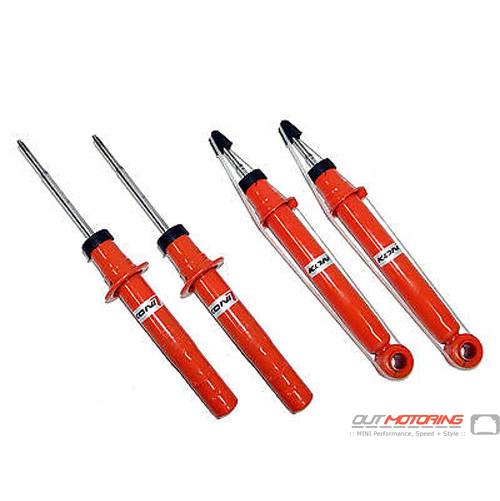 KONI is an industry leader in designing shocks and has applied their complete engineering and development knowledge to the MINI Cooper suspension. They offer twin-tube low pressure gas construction which is way easier to install than a mono-tube high pressure shock. These reasonably priced shocks will give you the smooth ride you need. KONI shocks have a lifetime warranty. Try getting that from the tuner garbage. Available for all Generation 1 MINIs with build date after March 2002. Build date (see drivers side door jamb for build date).